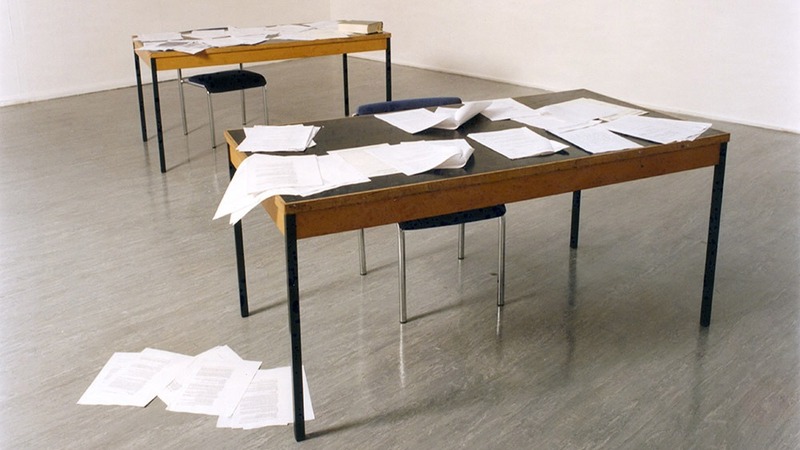 Litigation papers, two tables and chairs, plan of networks of creativity on paper, pins. 120 invitees were randomly selected through personal encounter with the the artists in December 1997. They were offered an opportunity to exchange habitual thought processes for creative thinking at a date and time proposed by the artists. In exchange, the invitees gave the artists information as to their probable location at that date and time. Thus simultaneous networks of creativity were potentially effected. The locations were plotted on a real world map. They were then transferred onto plain white paper as miniscule raised dots. Thus all geographical boundaries are invisible and the networks (of creativity) are practically invisible on the face of that document. Subsequently, this was deemed “Precious” and a dialogue over its ownership commenced through simulated litigation. Interactive Dialogue was a project by B+K.